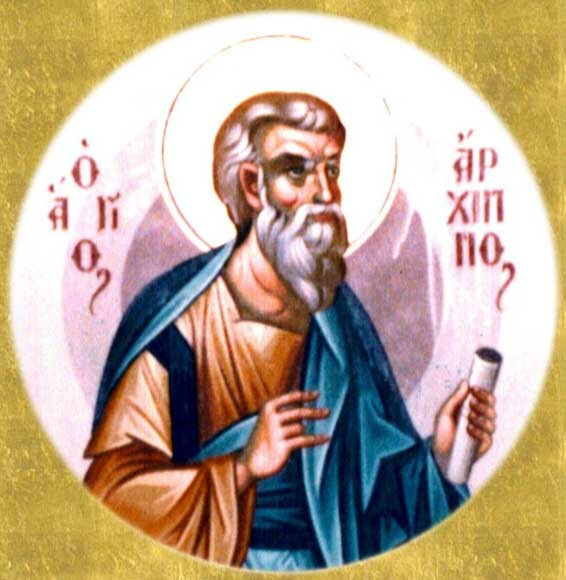 Archippus was one of the Seventy Apostles. The Apostle Paul mentions him in his Epistles to the Colossians and to Philemon: "And tell Archippus, 'See that you fulfill the ministry that you received in the Lord'" (Colossians 4:17); "To Archippus our fellow soldier" (Philemon 1:2). In the town of Colossae, the center of Christianity was in the home of Philemon. Here Christians gathered for prayer. In writing to Philemon, the Apostle Paul called this "the church at your house" (Philemon 1:2). At that time, the apostles ordained their disciples as bishops; some of them in permanent places and others as missionaries traveling to various places. Philemon was one of the latter. Apphia, Philemon's wife, hosted and served in the domestic church. At the time of a pagan feast to the goddess Artemis, according to their custom, all the faithful in Colossae gathered in the home of Philemon for prayer. The pagans, learning of this gathering, rushed and apprehended all the Christians; Philemon, Apphia and Archippus, as leaders. 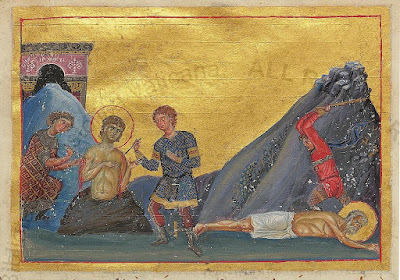 After Governor Androcles failed to persuade them to sacrifice to the idols, at first they flogged Archippus and then they buried him up to his waist. Children were then set upon him who began piercing him with needles. Afterwards he was stoned to death and received the crown of martyrdom. Saint Archippus is celebrated again on November 22nd with Saints Philemon, Apphia and Onesimus. With thy whole heart thou didst follow the way of holiness, and become a companion of the Apostles, O Archippus. By thy word thou didst preach the faith, and by thy life thou didst uproot shoots of evil. Having proved steadfast in contest thou wast granted the crown of righteousness. The Church has thee as a great star, O Archippus, and enlightened by the rays of thy miracles she cries out to thee: Save those who faithfully honour thy memory.